SVG Themes are used for visualising Rocrail objects as graphical symbols in Rocview like tracks, blocks, signals and so on. Installing one or more SVG Themes are required for Rocview's normal operation. The only up to date and complete theme is the SpDrS60 Theme which is always maintained in case of new objects or changes in existing ones, and is set as primary default after installing Rocrail. All other themes can be used as primary theme to replace a subset of the main SpDrS60 Theme; Secondary themes will supplement missing symbols of primary themes. The SpDrS60 Theme should be set at least as one of the secondary themes. A primary theme is listed on top of all other themes: See Symbol directories. Only symbols, not covered by themes listed above a selected theme, can be supplemented. To replace some symbols of other themes the wanted theme should be pushed up in the list to make it more primary. All changes in the theme list will require a Rocview restart. Designing country specific signal aspects in a new theme and place this theme as first one in the Symbol directories to replace the default aspects could make sense. In this case it is advised to check the signal documentation and symbol naming: Multi aspect signals. The Analyser will use always the SpDrS60 Theme as virtual reference for size, orientation and shape for calculating all possible routes. In other words: If the graphical representation in Rocview does show a different layout in detail then when using the SpDrS60 as primary theme the analyser results will/can be unexpected or faulty from the Rocview point of view but must be considered as right. The size, orientation and shape of a primary theme must resemble the SpDrS60 Theme for functional results. Theme properties are optional and are placed directly in the Theme directory inside a properties.xml file. Settings made via the theme properties file are not changed by user settings made within Rocview. After a restart of Rocview the default settings from the theme properties file are restored. The button [Properties] in den SVG theme setup opens this dialog. When invoked, the dialog is filled with the data of the Properties file (properties.xml) of the first SVG theme. If the theme does not contain a Properties file or definitions are missed inside it, default values are used. The name of the SVG theme. Changes to the identifier or entries in an empty field will be not saved. 1. 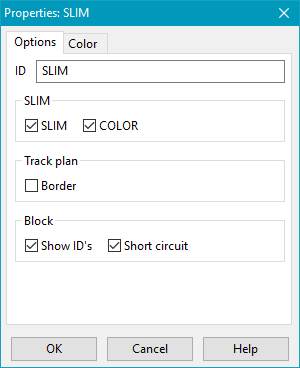 Check box activate SLIM themes. 2. Check box activate the color for the SLIM theme. Check box activates a track plan frame1). 1. Check box activates the identifier in the Block symbol. 2. Check box activates the display of a Short circuit area. Background color for objects which are set to 'Out of operation'. 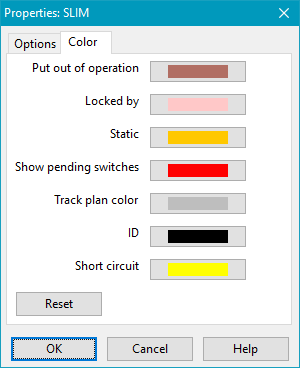 Background color for objects which are locked by a locomotive. Background color for objects which are set to 'Static'. Background color for switch objects which movement is pending. Background color for objects which signals a short circuit. Reset all colors back to its default.